After a change of venue, one of the most unique shows at sea may be coming to a port of embarkation near you. Legends in Concert is moving from Norwegian Epic, where it has been for the last five years, to Norwegian Pearl beginning with the current 2015/2016 winter season. Costa Luminosa aced its US Public Health inspection even though its call was just a port call on a 98-day round-the-world cruise. AIDA found success marketing to people who were already on vacation by taking their ships right to the resort where people were vacationing. Carnival has declared a regular quarterly dividend. Do You Hear That Buzz? Have you checked your accounts on at least two social media services today? If so, you might be the target of Royal Caribbean’s latest ad campaign, but then again, you’ve been on a cruise, so they really have their eye on someone else. At dead center of their sights are Millennials who have never been on a cruise and use social media very heavily. Those are the people who are really being invited to “Come Seek” in the ads and will really get it. Anyone else who wants to can come along for the ride, but they may not understand like those in the center of the bulls eye do. These are three of Royal Caribbean's five-second spots that will begin airing Monday. They are designed to pique your interested and get you to watch the longer 30-second spot that will follow. Carnival Legend arrived in Sydney earlier this week for her second summer cruising Down Under alongside Carnival Spirit which is based there year round. You can see how happy they are as the ship passes under the Harbour Bridge in the photo below. Next winter (2016-2017), P&O’s Britannia will offer passengers an option, for the first time, of sailing from St. Lucia. And for the first time, P&O will be offering a seven-night Caribbean product. Details appeared in the October 15 edition of Cruise News Daily. A new and magical experience awaits passengers on three Princess ships beginning this fall. Guests aboard Crown Princess in Los Angeles Saturday night got a preview and gave it rave reviews. What is it? It’s Magic to Do, an original new production for Princess Cruises from the Oscar, Grammy and Tony award-winning composer of Wicked, Pippin and Godspell, Stephen Schwartz. You can get a little preview in the video below. Breaking 8:00am EDT - Carnival Corp will expand further into the Chinese market when two additional brands homeport ships in China in 2017. The Carnival and AIDA brands will join Costa and Princess selling to Chinese passengers and sailing from Chinese ports. Just a day after Norwegian Cruise Line announced their plans to enter the Chinese market, Carnival announced this morning that they are adding capacity, not by just adding two ships, but by adding two of their brands, making a total of four Carnival brands which will be sailing in China by 2017. Carnival Cruise Line and AIDA will each bring a ship to China sometime in 2017. They will join Costa and Princess (with two ships, one of which is this the first purpose-built for China). 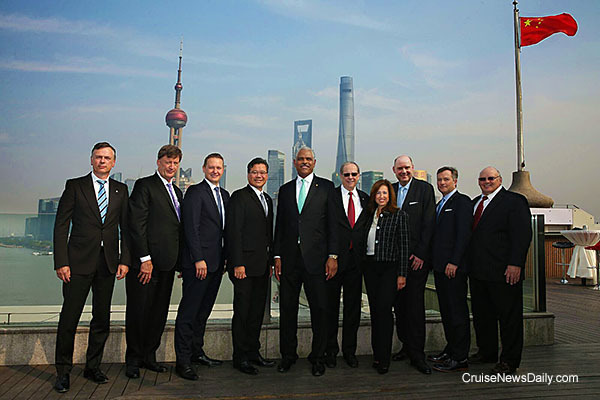 Carnival execs gather for a photo op in Shanghai after the announcement this morning. 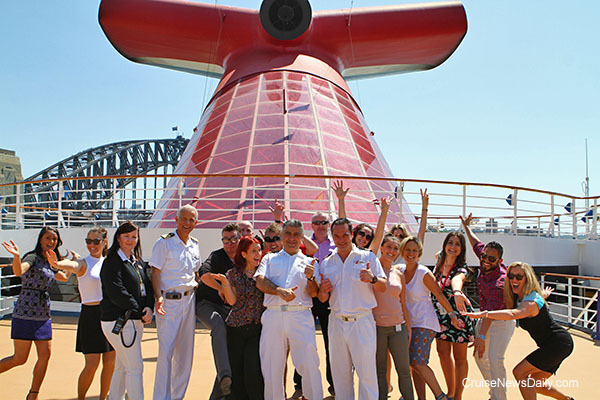 Photo courtesy of Carnival Corp. All rights reserved. May not be copied or used without permission. Is there room for one more great big brand-new, factory-fresh ship in China designed especially for the unique market? Of course there is, and Norwegian Cruise Line has diverted their next state-of-the-art Breakaway Plus ship there. Are the Stars the Same in the Southern Hemisphere? Are the stars the same in the southern hemisphere? Let’s find out. Do you know singer Jessica Mauboy and actress Kate Ritchie? They are well-known Australian stars, and they will be the godmothers of P&O Australia’s newest ships, Pacific Aria and Pacific Eden, naming them on November 25.